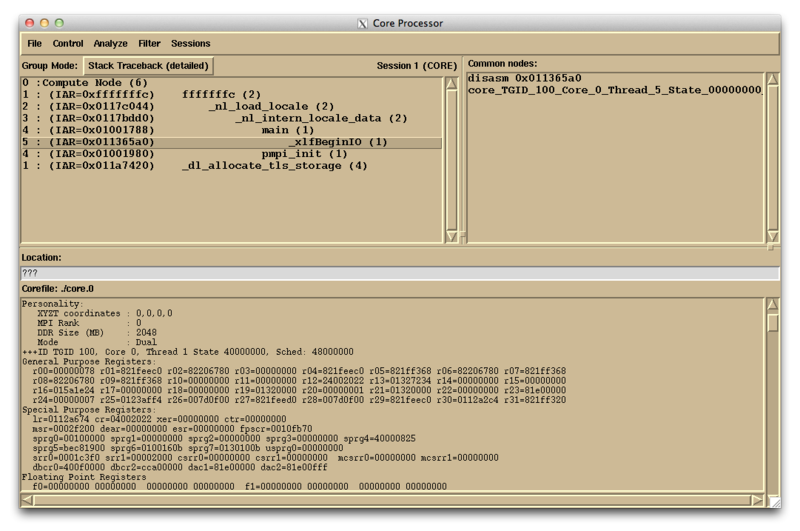 Coreprocessor is a basic parallel debugging tool that can be used to debug problems at all levels (hardware, kernel, and application). It is particularly useful when working with a large set of core files since it reveals where processors aborted, grouping them together automatically (for example, 9 died here, 500 were here, etc.). 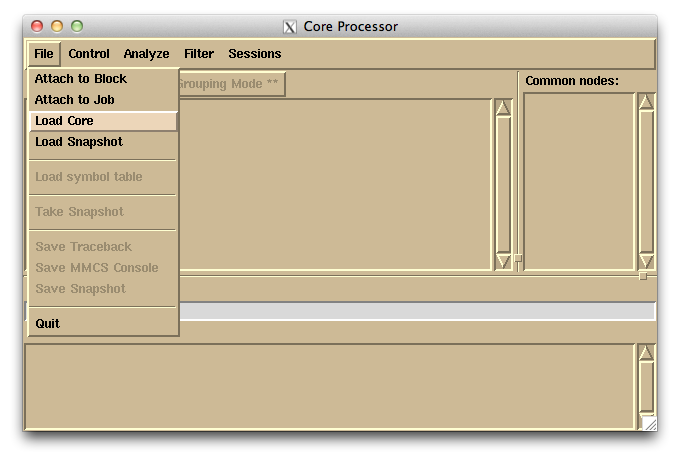 See the instructions below for using the Coreprocessor tool. Core processor has two basic modes of use. One mode is connecting to a running job and getting some basic debug output and the second is to analyze the lightweight core files that the system generates in a failure. 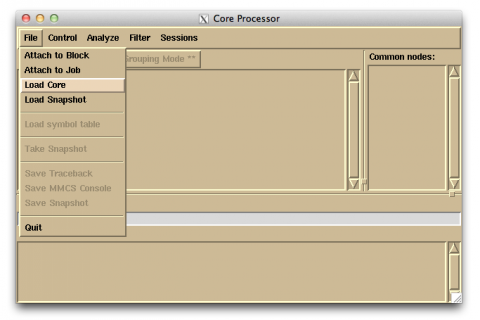 See Core File Settings for how to control core file generation. 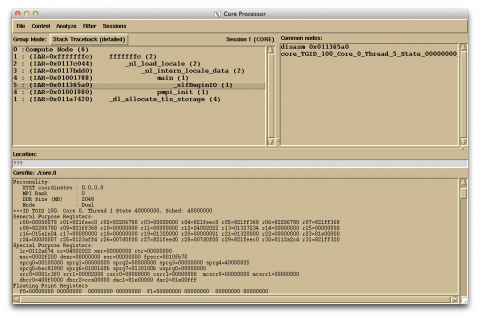 The coreprocessor.pl command has a reasonable help summary that describes it capabilities. Take a look to see what you can do. In order to connect to a running job you will need the Blue Gene job id. This job id is different from the Cobalt (scheduler) job id you normally work with. This Blue Gene job id can be found in the standard error log. The number listed between 'job' and 'started' is what you want, 667070 in this case. The following is an example for how to check a running job to see where some of the MPI ranks are during execution. This is useful if you think the job is hanging for some reason. The '-b=<binary name>' argument specifies the binary running. If you specify this, the stack trace will show the functions rather than addresses. The '-nogui' option will print the output to the screen rather than creating a X session. The '-mode=Survey' will sample a subset of the MPI ranks and print the stack trace information in groups and each group will be annotated by how many ranks are at that position. The '-j=<bg_jobid>' argument is where you put the Blue Gene job argument to connect to your running job. line: tool 4 started on 3 I/O nodes for 1024 ranks. Make sure you have an X server running on your laptop or workstation and your DISPLAY set. Connect to an ALCF login node via ssh -X to tunnel your DISPLAY. Go to the directory with the core files. 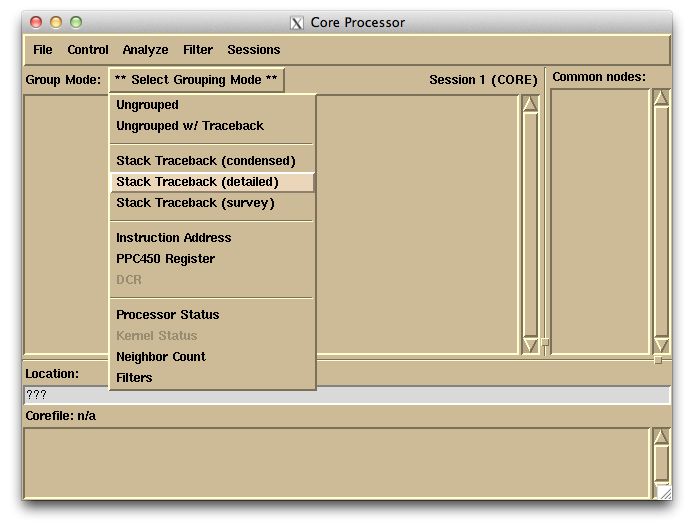 The main window will show a stack listing with branches for each group of processors, and the count at that spot. Remember, to obtain the most detailed information, the executable needs to have been compiled with the debug option -g. Then, if you click on any line, it will show the source line number info and the list of core files at that spot. If your Internet connection is slow, consider using the Coreprocessor X-Windows client displaying a Virtual Network Computing (VNC) session. For more information, read Using VNC with a debugger.